Disney returns with another one of its classic animated films put to a DVD anniversary edition, and of course that means I'm going to be watching it (my wife loves theses). 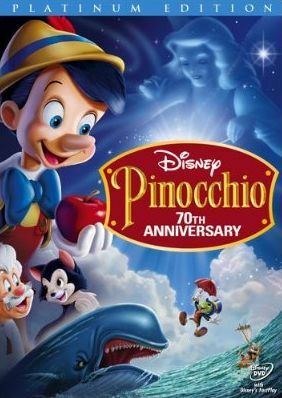 This time around it is Pinocchio, and it's the 70th anniversary. And I must say, the transfer looks fantastic. They really cleaned up the film, as it's clean and crisp. 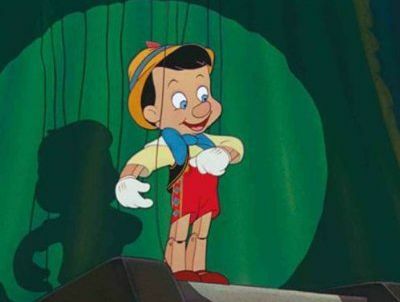 Now Pinocchio isn't my favorite story of the Disney fairy tales, but I was surprised by how much I had forgotten about it. Did you realize that his knows only grows once in the whole movie? I totally forgot that. 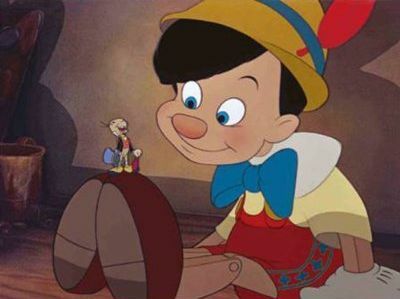 I'm sure there's nobody out there that doesn't know the basic story of Pinocchio, but I guess I'll tell ya anyway because I'm a jerk like that. Old man Geppetto lives alone with his cat Figaro and his fish Cleo, both who are totally adorable by the way. Since there's no cable TV or videogames, Geppetto gets a bit bored and decides to build a wooden marionette doll ("action figure"?) and names him Pinocchio. Then he goes to bed and forgets to open the window (yeah, people were a little backwards back then), so he tells his cat to go open it even though he is laying right next to it and would only have to sit up to reach it... good to see I'm not the only jerk around here. With the window open, old man Geppetto spies a star and wishes on it that Pinocchio was a real boy. Now, since he's been a good dude and helped lots of people, a hot translucent lady in blue comes down from the sky and and grants Pinocchio life, even though he's still made of wood... so I guess that makes him a wooden android or something? 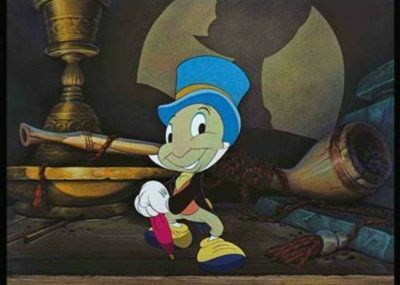 Oh, and we can't forget poor Jiminy Cricket (who doesn't really look anything like a cricket, but whatever). The Blue Fairy decided to make this little fellow Pinocchio's conscious, for whatever good that ends up doing (uh, no good actually). 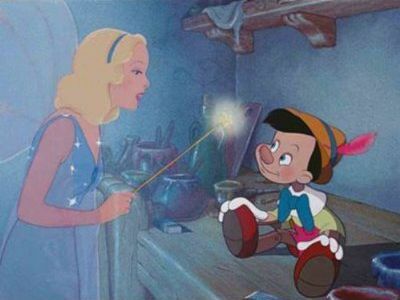 On Pinocchio's first day of school, he never arrives. Amber alert! Amber alert! C'mon, I know the guys old but you'd think he'd walk his new wooden son to school on his first day. Anyway, he's fast-talked by Red Fox into going into showbiz (aka working for an evil puppeteer). All seems good at first until the puppeteer locks Pinocchio in a cage and drives away. Meany! But Jiminy arrives to save the day! Unfortunately, he can't... wow, big help he is. So the Blue Fairy appears and helps them out. So now everything's good, right? Nope! Red Fox is back, and before long Pinocchio winds up on Pleasure Island, which is kinda like that place in Teenage Mutant Ninja Turtles where all the bad kids were hanging out, you know, the East warehouse over on Lairdman Island. Except at pleasure island, the kids don't turn into ninjas, they turn into jackasses... literally. The reason? I dunno. Maybe major or something. That parts conveniently never explained. Luckily, Pinocchio escapes with just a pair of donkey ears and a tail. Okay, so now everything's good, right? Nope! Now there's another adventure involving a whale, but I won't go into that. Now, the DVD I watched was part of that 2-Disc Blu-ray set with the extra normal DVD packed in. So while there is probably a bunch of extra features on the Blu-ray version, there were only a few on the DVD. One of them is the pop-up facts thing where random facts about the movie will pop-up as you watch the film. Some were interesting, and it helped to keep me from getting bored. There is also a commentary track, and a menu that lets you jump to the various songs. I think that was about it. And I think that's about the end of my review.